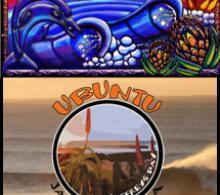 Ubuntu Easy Living Lodge is situated in the heart of South African surf-country, Jeffrey's Bay, and caters to fun-loving people looking for an epic yet affordable base. Its a mere 100m to the beach & magical Supertubes, and there are great wave-views from around the house. Our guesthouse is situated less than 100m from the beach in the Wavecrest area of Jeffrey's Bay. It's a short walk to the paddle-out channel at Supertubes and everything else is in close supply. Watching the waves at sunset from the balcony while sipping a cold one is a daily ritual. The guesthouse sleeps 24 people when full, so we are able to maintain a relaxed and comfortable atmosphere. There are 5 double rooms, 1 four-sleeper mini-dorms, and an 10-sleeper dorm. All linen is provided. 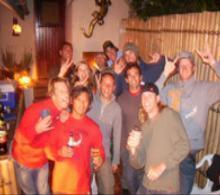 Tours Surf lessons, sand boarding, kite surfing, horse riding, bungee jumping, kloofing, paddle boarding, Party Party and lots more! Ubuntu Easy Living Lodge is situated in the heart of South African surf-country, Jeffrey's Bay, and caters to fun-loving people looking for an epic yet affordable base. Its a mere 100m to the beach & magical Supertubes, and there are great wave-views from around the house. Our guesthouse is situated less than 100m from the beach in the Wavecrest area of Jeffrey's Bay. It's a short walk to the paddle-out channel at Supertubes and everything else is in close supply. Watching the waves at sunset from the balcony while sipping a cold one is a daily ritual. The guesthouse sleeps 24 people when full, so we are able to maintain a relaxed and comfortable atmosphere. There are 5 double rooms, 1 four-sleeper mini-dorms, and an 10-sleeper dorm. All linen is provided.